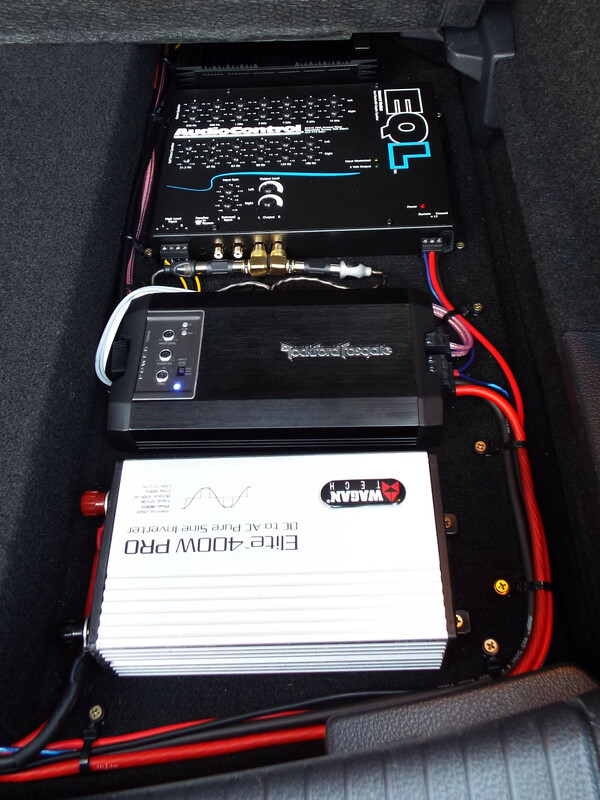 From top to bottom: Helix amp, graphic equalizer, subwoofer amplifier, pure sine wave inverter. I decided that a graphic equalizer was my best option for balancing the bass sent to the subwoofer to my satisfaction. I chose Audio Control’s EQL. Unfortunately(? ), it didn’t quite fit where I intended to mount it. I needed to make some room in my already-tight equipment area. I had considered a 500W amplifier for the sake of having more headroom on the system. 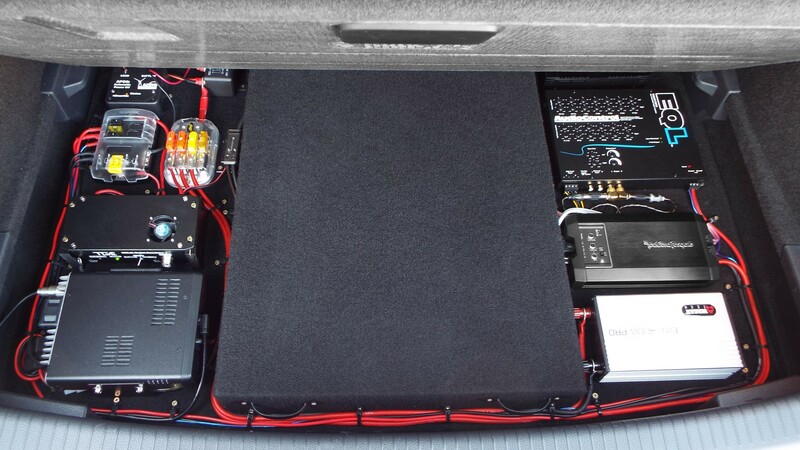 I decided to accelerate my idea by getting a Rockford Fosgate T500X1br, a 500W amplifier with a footprint that’s substantially smaller than that of the P300X1. Not only is it small, it also features forced ventilation, which will be very helpful in its tiny home. Instead of music, this time I used a series of test tones to “tweak and peak” the inputs to the system. I also used pink noise to check my settings. I made minute adjustments over the next few days. In the end, I’m very pleased to say that the system sounds better than ever. Much to my surprise, I’m getting more bass and better sound from the new system even though it is pushing no more power than the previous setup. It MUST be because I was able to tailor the signal much better with the EQL than I had with the previous setup. I use a Rockford Fosgate PLC2 Remote Punch Level Control where my previous remote used to reside. I figured I would use the Punch P3SD4-10 subwoofer until I’m ready to upgrade to a 1-ohm T1S1-10. However, I’ve found that my new system allows me to leave the PLC2 setting at the 10 o’clock position, with 4 o’clock being “max.” This amount of headroom in my adjustment tells me that I don’t need to upgrade the subwoofer at all. PS: This article was edited to remove confusing references to my previous use of an LC2i. The LC2i worked well with my Mk6 and its Fender Premium Audio system. However, it was not a good fit with the Helix system in my Mk7. I think that’s because Helix punches-up the bass in the 50-70 Hz range to work well with its 6-inch subwoofers. I use the EQL to tailor bass in the 30-50 Hz range, thereby complimenting the Helix amp output.